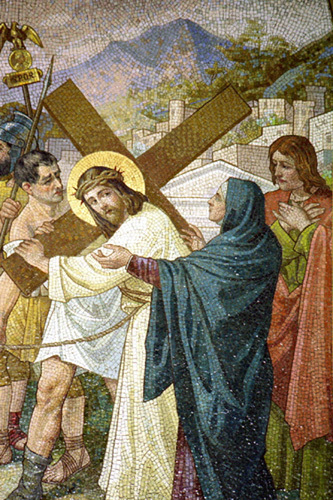 At the fourth station Jesus comes face to face with His mother. The pain and anguish is shared by both of them. We see Jesus as our Savior and Messiah but Mary see’s Jesus as her Son. The pain Mary felt as she watches her son carry His cross to Calvary as He is beat and mocked by the scores of people would have been unconsolable. Mary watches and can do nothing to save her son. Jesus sees the pain in His mother’s eyes and yet is comforted by seeing her as only a mother can console her child in the times of pain and agony. When we are going through those hard times and we have someone around us to comfort us makes a difference. Sometimes it is a parent, spouse, family or a friend that can help us during those times of suffering. Even just the sight of someone can have us breathe that sigh of relief. It does not mean that they can take that pain away or stop what is going on but just knowing that someone is there to listen and understands the pain keeps us going. The person there feels our pain and tries to comfort us. There doesn’t need to be a conversation but just the mere presence or a gentle touch lets us know we are not alone. If we feel that we are alone during those hard times it takes a harder and quicker toll on us. We are lost and seems like no one cares for us. In the time we live in we are just about always able to make some kind of contact with people we care about. We can call, text, send an email, or drive and even fly to see those we care for. A simple text saying “ I am here for you” or “ You are in my thoughts and prayers” can make a world of difference. Just the thought that someone took that time to think and maybe pray for us can make a world of difference. We may never know how we were able to help someone when they needed it. It is better to extend your hand then think they want to be left a lone. Until tomorrow, God Bless, and drop that someone who has been on your mind today a message and tell them you care.